A topnotch kayak's one thing, but you need more than just a boat to take advantage of it. At Paddlers Cove, you'll find--in addition to one of most impressive selections of 'yaks on the East Coast--a full lineup of kayaking accessories, from spray skirts and paddle leashes to car racks and instructional DVDs. And just as with the kayaks in our warehouse, you can feel confident that the gear and equipment we sell here at Paddlers Cove is all top-of-the-line. Shoddy or second-rate just aren't in our vocabulary. From Hobie kayak parts to Ocean Kayak accessories, outfit yourself for all of your on-the-water adventures via the expansive Paddlers Cove inventory! There's an incredible variety of accessories for kayaks on the market these days. Just as the technology of the boats themselves has evolved with the expanding popularity of kayaking, so too has the associated equipment. Some of this reflects a simple updating of basic gear; other innovations have come as kayakers themselves recognize novel needs as they explore new waters--and discover new uses for their time-honored crafts.! Like a hiker who sets off on a well-marked trail for an afternoon stroll and ends up spending nights in the wilderness, kayakers need to be aware of the possibility of unexpected contingencies on even the most routine of paddling outings. Your safety needs to foremost in your mind when you set off from shore, and you can feel that much more confident if you have the essential tools that can help keep you out of harm's way. Here at Paddlers Cove, we stock top-quality versions of safety accessories for kayaks. These include emergency signal lights such as the ACR-C-Strobe, which emits a powerful beam visible from as far as two miles away. 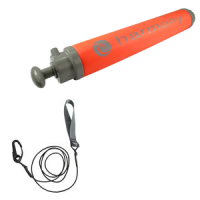 We also carry a variety of paddle floats and leashes for staying afloat in the event of a capsize and making sure you don't lose your all-important paddle. Kayaking accessories for comfort can seem trivial at first glance, but they can dramatically improve your ergonomics and happiness over many hours of paddling. Consider the Can-Panion Cup Holder, which secures your beverage within easy reach and fits most kayak models. Or how about the Extrasport Hydration Pack for staying hydrated in ultra-efficient fashion? 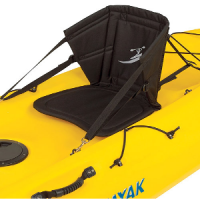 We also carry a wide variety of kayak seats and seat accessories (such as thigh-straps, heel pads, and paddle saddles), which add up to some of the most important accouterments you'll ever purchase for your boat. An uncomfortable or inadequately supportive seat can wreak havoc on your body and ruin a kayak expedition. Explore the Paddlers Cove selection of spray skirts and splash decks. We've got skirts specially designed for recreational kayaks, sea kayaks, and whitewater kayaks--important attachments for keeping yourself and the cockpit dry. Slash decks ward against the annoying or downright chilling dousings you can take from your paddle strokes. You need a well-stocked repair kit for on-the-fly patchup jobs. Look to Paddlers Cove for adhesives, replacement parts, hand pumps, and other fixit fundamentals. Dry bags and dry boxes, meanwhile, keep valuables and safety equipment in waterproof hideaways. These days, you can even pick up watertight containers expressly for small electronics such as smartphones and mp3 players. Accessorizing your kayak can improve its performance, expand your capabilities, and boost your enjoyment. From camera tethers and tripod mounts to rudders and compasses, we've got the tools and upgrades you need. 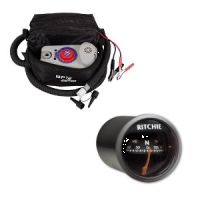 Don't forget about the equipment you need to safely and efficiently tote your kayak from garage to boat launch and back again. 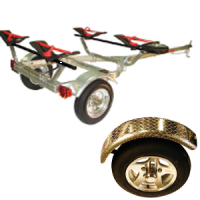 We've got a complete inventory of straps, car racks, and kayak trailers. We also offer covers for keeping your kayak clean and protected when it's not being used. And speaking of, we've got a wide range of elegantly simple contraptions for storing your boat. Try the HighRise Wall Mount Kayak Storage Rack, the Kayak Hammock Deluxe Hoist System, the Suspenz Universal Portable Kayak Stands, or any of the other possibilities for floor, wall, or ceiling-secured 'yaks. When you can't be out exploring the creeks, lakes, and oceans, you might as well expand your kayak knowledge and indulge in some "armchair paddling," right? 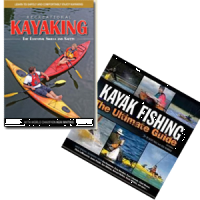 The Paddlers Cove reference library includes many excellent instructional books and DVDs, covering everything from basic kayaking to the specialized skills required for open-ocean or whitewater adventures. Whether you're looking for Old Town kayak accessories, Hobie kayak accessories, or just general gear, Paddlers Cove has what you need to outfit your boat. Check out our complete selection of kayaking accessories today!